Additionally, the board heard first briefings on paving contracts, tech bond purchases, and the Freeman School lease renewal. Trustees voted to approve the 2013 spring grant awards. District superintendent Patricia Green led off the presentation on the district’s expenditure report and budget proposal by saying that “none of the potential reductions are without a significant amount of pain.” The projected budget deficits for the 2013-14 school year are at least $8.67 million, following five years of “already massive cuts,” she said. The district’s foundation allowance [per pupil allowance from the state of Michigan] is $9,020 – an amount less than the foundation allowance in 2001-02. The board had asked Green and the administration to make a best estimate to prepare a list of potential budget cuts, which were presented at its Feb. 27, 2013 meeting. Since then, the administration has continued to cost out potential reductions, and “the picture is not pretty.” Until something changes in the revenue stream from Lansing, these cuts won’t be the end of it, said Green. The proposal the administration presented was, as Green described it, the beginning of “some serious deliberations that need to take place.” She reiterated that the administration wanted to work with the board to balance the budget. But she noted that if one cost savings could be taken off the list, it would have to be replaced by an equivalent. Nancy Hoover, AAPS director of finance, first gave a brief overview of how AAPS spends its money. AAPS director of finance Nancy Hoover. The majority of the general fund budget is spent on instruction and instructional support (80%). The rest is spent on operations and maintenance (10%), athletics (2%), transportation (3%), and central administration (5%). To illustrate the increasing problem of funding the Michigan Public School Employees Retirement System (MPSERS), Hoover then presented an analysis of MPSERS pension costs per pupil. While the state has worked to contain the costs in recent years, since 1994 the pension cost per student has steadily risen from $280 in 1994 to $1,366 in 2012. Subtracting out the pension cost from the foundation allowance leaves the district with $7,654 per pupil. Taking into account basic expenditures, as well as step and fringe increments, the district’s projected expenditures for 2013-14 total $192.66 million. Given $3.4 million in staff concessions, the district needs to make $8.67 million in reductions to balance the FY 2013-14 budget. Eliminate high school transportation ($466,000). Nelson said he was concerned about the scale of what they had to do. He asked how many retirements had already been handed in to the district. Hoover said that on average, between 40 and 50 instructional staff retire every year. Currently, they have 12 notifications. She said the smaller number could be a reflection of the reduction in the early notification incentive that was made last year. Mexicotte asked about the timing of layoff notices. 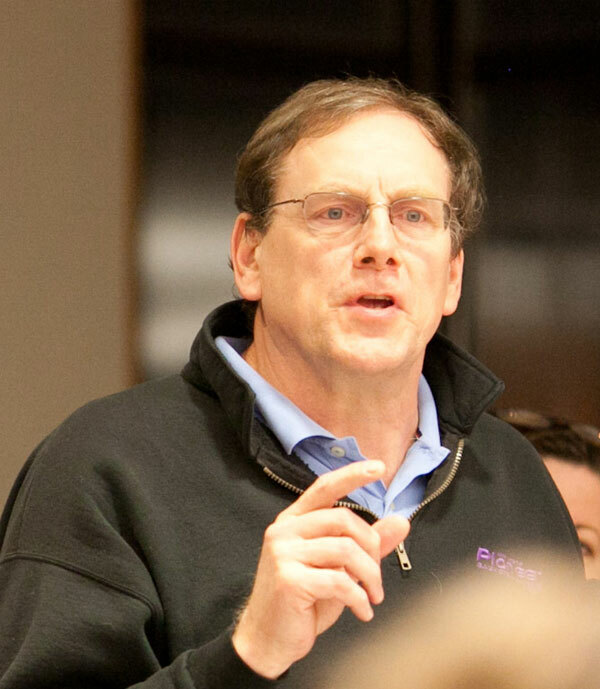 Comsa said that if it involves the Ann Arbor Educational Association (AAEA), they would have to make a determination the last day of the school year. If they are looking to reduce 30 positions, Mexicotte said, they would have to notify approximately 200 staff members by the end of the year. Trustee Susan Baskett was concerned about the implication of cutting staff. If the district were to cut 7th hour, as well as the reading intervention teachers, that would mean cutting services that have taken a lot of time to build up. She asked how they would compensate for the loss of services provided. AAPS deputy superintendent of instruction Alesia Flye said that they would like to partner with the community to make up for the cutting of services. Trustee Andy Thomas suggested telling the high schools that if they wanted to keep things like 7th hour or trimesters, they would need to do it with fewer teachers, then let the building administrators figure out how to make that work. The trustees also talked briefly about the issue of transportation. Thomas noted that in the proposal, the Roberto Clemente Student Development program would remain as it is, but high school transportation would be cut. Because Clemente was not located on an AATA bus route, he wondered how students would be able to get to the remote location. Randy Trent, AAPS executive director of physical properties, acknowledged that if the district were to eliminate high school busing, it could not discriminate between schools. Green noted that transportation must include special needs and homeless students. Forty-two percent of Clemente students are classified as special education. Mexicotte questioned how they were able to supply provide to Clemente but not to Community High. Trustee Simone Lightfoot asked if the number of common bus stops could be increased. Liz Margolis, AAPS director of communications, said that this school year, the district started off with fewer common stops, but ended up adding more for safety reasons, especially for students who lived in the more rural areas of the district. Margolis said the district will continue to have the conversation about transportation. Margolis also noted that three AAPS routes at the high school level have been replaced with Ann Arbor Transportation Authority routes. So far, they’ve heard positive responses about the augmentation of service with the AATA. While the consolidated bus services “haven’t worked perfectly for everyone,” Margolis said that anecdotally, the district hadn’t seen an increase in tardiness or absenteeism due to the changes made to busing last year. Several district athletic directors were on hand to answer questions from the trustees. Rusty Fuller, Slauson’s athletic director (AD), said that they worked to make incremental cuts to the athletic program instead of the million dollar cut that was initially proposed. He emphasized that the ADs would like to work with the district more – because they did not realize that the cuts to the middle school baseball, softball, and basketball would be on the budget list. Slauson Middle School Athletic Director Rusty Fuller. The pay-to-participate fees generated some discussion among the trustees. Baskett asked how the increase in pay-to-participate would impact the number of students who participate in district sports. 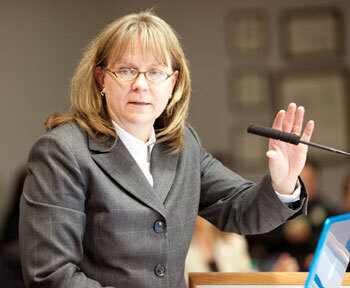 Fuller said that Dexter Public Schools had significantly increased their fees and had subsequently seen a huge increase in scholarship requests. He said that because of the number of programs AAPS has already cut, they’ve seen a decline in participation, especially with girls. Dottie Davis, Huron High AD, said that the district hasn’t raised its pay-to-participate fee in three years, saying “we’re the cheapest in town.” Fuller said that the ADs were comfortable with the middle school increase, as the issue at that level isn’t as big as it is with high school athletics. Hoover also walked through reductions to operations totaling $1.23 million. Thomas asked that if there were any discussions about savings coming from reductions in the administrations’ salaries. He acknowledged that they were in negotiations with AAAA, and that any voluntary reductions in salary among the senior administrative staff had not been included in the budget proposal – because nothing was finalized. As the contract negotiator, Comsa said the board had given him direction on the amounts. While he couldn’t give trustees a number just yet, he said they had given him direction and, as the negotiator, he was working towards that. The trustees spoke in depth about the role the Ann Arbor Public Schools Education Foundation (AAPSEF) could play in generating private giving from the public. Green noted that the AAPSEF has not been making any grants to the district since their executive director resigned at the start of the school year. They haven’t been able to fundraise this year, but will be working to improve upon that this next year. Trustee Christine Stead said that while she understood the foundation’s circumstances, “we need them more than ever.” She wanted to encourage people to donate directly to APSEF with the assumption they’ll be looking aggressively at the district’s budget. Or the board needed to explore other options for people to donate. She said she would like to get an update on the AAPSEF fundraising. From right: Irene Patalan, Christine Stead, and Deb Mexicotte. Mexicotte noted that the topic of targeted funding came up over and over in the dialogue meetings. She expressed her desire for the community to have “a clear couple of paths” to donation. Thomas suggested the Karen Thomas Memorial Fund as an excellent conduit for making up a cut to the media purchases. The memorial fund was established in 2008 following the death of Karen Thomas, a local writer and Thomas’s wife. He acknowledged that they wanted to capitalize on the “sense of urgency” that has been created by the budget dialogues and board discussions. Mexicotte suggested having a smaller, more widespread donation process by which the community could express their “$20, $30, or $40 desire” to help the district. Trustee Irene Patalan wondered if they could have a fund-drive similar to the public radio stations. After acknowledging how awful the cuts were, Nelson said all the trustees would, if they could, choose to fund all the programs. During the community dialogues, over 100 people offered to help with raising revenue. The district needs to work on specific channels to help mobilize those people, Nelson said. Hoover noted that the proposed cuts eliminate 75 FTEs total $19,293 more than the amount that is needed to balance the budget. For any additional shortfalls that might occur, Hoover said, the recommendation is that they be paid for out of the fund balance. Stead asked how much money the district needed in its fund balance to cover summer payroll costs. Hoover said she wasn’t sure – because they had never needed to do that. Stead said that it could be important: If the district had less in its fund balance than it needed to cover payroll, the district would need to borrow the money from the state, which would mean interest fees would be incurred. Green highlighted some of the changes that were now “off the table” compared with the initial set of proposed cuts. Elementary principal sharing was determined to be a safety risk, especially in light of the recent Sandy Hook Elementary (Newtown, Connecticut) shooting. Several items, such as elimination of media specialist positions, could not be implemented because of contractual issues. Theatre funding was reduced instead of eliminated. It has been decided that the administration will be conducting a more thorough review of all alternative programs in the district – so the Roberto Clemente Student Development Center and Community High School were maintained as is. Middle school transportation was also recommended to be maintained. Lightfoot reiterated her call to “amend, rather than end.” She said she wanted to make sure the administration was talking to the people in the trenches rather than the people at Balas – so that they are really looking outside the box. Green said that administration has done that, giving as an example the trimester scheduling at Skyline High School. Mexicotte noted that this was the board’s first conversation about budget reductions, but it would not be the last. The administration has conceived what could be considered a draft budget at this point, said Mexicotte, and the board will be working under this framework. Outcome: No action was required by the board, as this was a first briefing. The trustees will continue to have budget update discussions until they finalize the budget. The 2013-14 budget must be finalized before June 30, 2013. On Saturday, April 20, the trustees completed the last of four community dialogue meetings on the budget. Mexicotte and Nelson reported out on some general findings at the April 24 board meeting. Nelson thanked the nearly 300 members of the public who showed up for the four dialogues. He said that he gained a lot in listening and talking with people, and that it was truly a two-way dialogue. Mexicotte said she and Nelson had compiled the sentiments expressed by the public. They will also be separating the items out into short- and long-term items. The documents Mexicotte created was divided into four different areas: (1) themes arising from questions and comments; (2)specific suggestions and ideas for alleviating financial stress; (3) strategies and questions that are useful guides to future work; and (4) reflections of Mexicotte and Nelson. During the April 24 meeting, the trustees talked over how the specific suggestions from the community could be added to the budget discussion. Nelson said that they needed to assess how best to approach some of the suggestions. Some of them could be explored through committee process, and some of them – such as illustrating the extent of cuts already made – could be immediately implemented. Thomas asked if there could be a tracking mechanism so that the suggestions made didn’t go into “a black hole.” Such a mechanism would allow the public to see that their suggestions were considered. Lightfoot asked if there was a place for additional comments and ideas from the community. Baskett asked if any of the ideas could be acted on for this year’s budget. 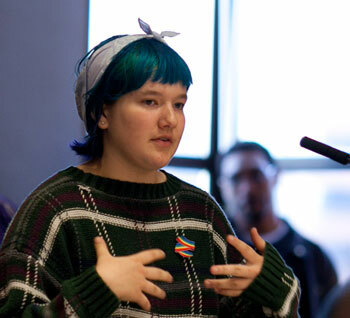 Mexicotte responded by saying that while some of the topics, such as redistricting, would not be acted upon for the next year, the dialogues helped inform her about what was most important to the community. Because maintaining a smaller class size was a consistent theme at the community dialogues, it will be a lens through which she now looks when faced with budget cuts. 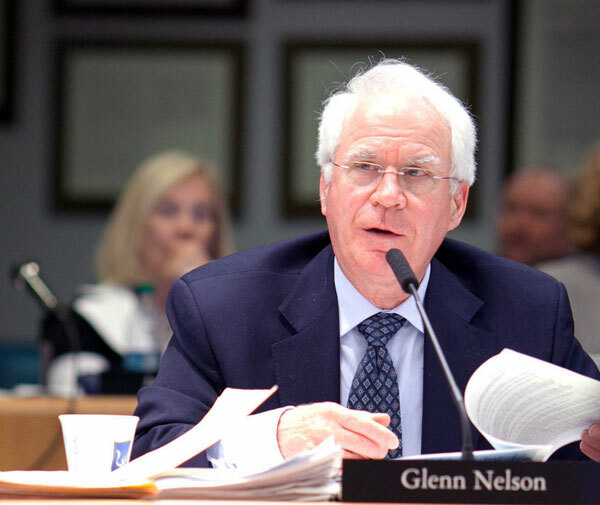 Nelson noted that some of the suggestions, such as eliminating half-day professional development days, needed to be worked through by a combination of board, administration, staff, and the public. Patalan was grateful for the work Nelson and Mexicotte put into compiling the data. The dialogues, she said, left her with the feeling that the community absolutely values its schools. She noted that the district website was a valuable resource for finding information. Moving forward, the trustees will work to identify the issues as: short-term suggestions that can be easily implemented; mid-term items that will need to be addressed in committee and with the administration; and long-term items that “need long-term work by the staff.” Green and the cabinet were an “integral part of the process,” said Nelson. Outcome: Because Mexicotte and Nelson are both part of the governance committee, it was decided that they will schedule a committee meeting to begin identifying the short-, medium-, and long-term items. A governance committee meeting is scheduled for May 3, 2013 at 9 a.m. at the Balas Administration Building. Eleven members of the public spoke to express their support of programs the board has identified for possible reductions. Christa Moran asked that the board make it so the budget cuts are felt across the district, not just by any one group. She asked that the programs themselves decide how they were going to have to tighten their belts. Several students spoke in support of the Roberto Clemente Student Development Center. Tevin Cole said that many doors wouldn’t have been open for him without Clemente. While there, he was taught: Anything is possible with self-determination. Karrah Weeder expressed her concern over what would happen to “all of us” if Clemente was moved or shut down. Anyse Malcolm, a Community High School student, spoke in support of Clemente. She said she was saddened at the lack of sympathy and empathy from the board. While she was grateful to attend Community, she said she saw that the relocation of Clemente would only devastate the students who attend the program. Nancy Kupina said that she couldn’t have been more wrong in her initial impressions of Clemente. Repeatedly using the phrase “you don’t know what you don’t know,” Kupina said the public entrusts the board of education to find out what the public doesn’t know. And she asked them to do that when it came to the “poorly researched recommendations” about Clemente. Clemente teacher Mike Smith asked that the board to imagine it was their sons and daughters who didn’t succeed in a traditional high school and who needed another option. He said that because of decisions the board may make, the program might not be there in the near future. David Malcolm said that the students of Clemente didn’t want to go through a “back door” of Pioneer. [This was an allusion to the possibility that the program would be relocated physically to the Pioneer High School building, with a separate entrance.] They wanted to stay where they were. In addition, Malcolm also recognized the Clemente and Community students who assisted with St. Mary’s Lodge #4 Adopt-a-Highway clean-up. Joe Merrick asked that the board not to make the proposed cuts to Clemente. It was a program his son was succeeding in, and it should be kept intact, he said. Parent Ed Borbely argued for maintaining block scheduling at Community High because it allows for more in-depth coverage of the curriculum and it produced results. Student Carson Borbely spoke in favor of maintaining block scheduling at Community High School. He said the school draws students into the district who would otherwise attend private schools, so it should be left intact. Parent Mark Vorobiev said that while he was not born in America, he recognized that high school sports were as American as apple pie. Cutting funding to athletics and other areas like theater and the arts will take away the district’s competitive advantage, he said. Earlier this month, superintendent Patricia Green announced her resignation, effective in mid-July. The trustees began discussing the search process at a study session on April 17, 2013. Before the regular meeting on April 24, the trustees met again for a study session to take steps to address some of the most pressing needs of their superintendent search: identifying a salary, determining a superintendent profile, confirming the superintendent search timeline, and approving an advertising schedule. Justifying her desire for a higher top number, Patalan said she interpreted the money differently. The money they have to manage is important to her, she said, and so she would like someone who has had experience in successfully managing expenditures. Nelson and Stead also believed $220,000 was too low. Stead said she was interested in “hiring high,” knowing they would have to cut because it was not likely they were going to have more money in the near future. Baskett said that while experience matters, “longevity is the key.” The community was willing to take a less experienced superintendent, so long as there was longevity in the position. Mexicotte summed up their position by saying that the board was in the same dilemma as it was last time. Their work was to do the best thing for the community by getting “the best candidate we think we can bear.” So they need to balance the demands of the job and the job market with what the community believes the salary should be. That’s why the low end is important, she maintained, because that number told the community where the board thought a superintendent might come from. There was some additional discussion about how the fringe benefits match up to comparable districts. David Comsa, AAPS deputy superintendent of human resources and general counsel, said the current superintendent package includes the salary, life insurance, reasonable expenses, and vacation days, with a value of about $50,000. Some other districts include benefits such as annuity and car allowances, which AAPS does not have. Because Nelson came to the study session with an adjusted profile already written up, the trustees used his as a “straw man” and amended it as needed. The trustees added to Nelson’s list. Stead focused on stressing the financial duress the district is under, saying the district needs a superintendent who understands Michigan’s financial plight – and specifically Ann Arbor’s situation. The idea of “a visionary” was repeated by several trustees. Mexicotte asked for the inclusion of media savviness. The ability to build relationships was also highlighted. The board also adjusted the advertising of the job opening to include some outlets that weren’t already listed by Ray and Associates – the search firm the board is using – and also to eliminate some places that didn’t have wide enough reach. Mexicotte noted that Ray and Associates had added LinkedIn as a new venue this time round. The trustees decided not to advertise the position with the Broad Center. Lightfoot raised concern about the implication of a Broad Center trained superintendent, saying that the leadership of the Education Achievement Authority (EAA) was heavily Broad trained. It was “antithetical to the basic tenets of public education,” Lightfoot contended. Stead agreed, saying that some of the political agenda behind the Broad Center was to work to privatize public education. At least two public forums will be held in the future to get community input on the superintendent search. Baskett reiterated that she wanted the community to be made aware that the board had discussed longevity, and was aware of what the community was saying. Trustees are looking for feedback from the community dialogues and from individuals, she said. Additionally, the trustees adjusted the timeline suggested by the search firm Ray and Associates to reflect an end goal of a superintendent named by the end of July. 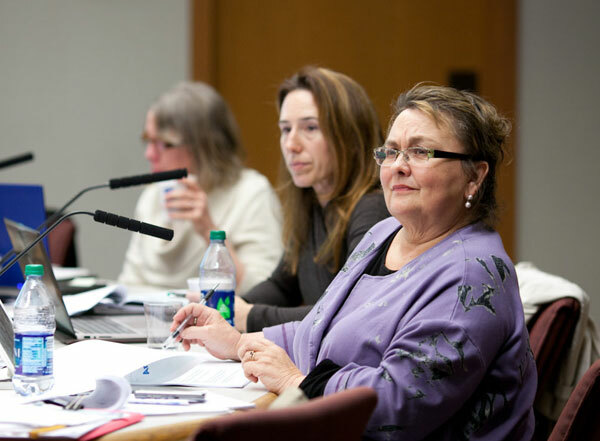 The trustees wrangled to align their personal schedules with the needs of the hiring process. It was determined that the final candidates would participate in a community forum the same week they would be doing the finalist interviews. Right now, that would fall during the week of July 5, 2013. Victor Stoeffler asked that the board “exercise restraint and thoughtfulness” when choosing the next superintendent. He expressed concern that the trustees had already proposed the parameters for the search, when so little time had passed for introspective conversations. After listing off some of the characteristics she believed the next superintendent needed to have, parent Jody Huhn endorsed Ben Edmondson, current Clemente principal, as a candidate for the superintendency. It was critical, she said, to find a superintendent who wouldn’t back down from challenge and who understands the needs and perspectives of the students, the staff, and the parents. Barbara Malcolm said there was a “systemic leadership problem” with the board of education, and specifically Mexicotte, because so many personnel have left under her tenure. She asked for Mexicotte’s resignation. At most regular meetings, the board hears initial briefings on items they will be asked to approve at a subsequent meeting. At the April 24 meeting, the board heard first briefings on tech bond purchases, paving contracts, and the Freeman School lease renewal. The 2013 spring grant awards was presented as a second briefing – for the board to approve the receipt and expenditure of the grant monies. Additionally, the standing committee appointments were finalized. Trent briefed the board on bid recommendations for district-wide network cabling and mechanical modifications to support the 2012 technology bond initiatives. Trent noted that the district is opting for CAT 6 in place of CAT 5 cabling. While more expensive, it will take longer to be obsolete, he said. The team also opted for adding a “student drop” because it was cheaper to do two at the same time rather than pursuing a second drop later. Trent also noted that if trustees approve the bids, they will have approved about 26% of the entire technology bond budget. Outcome: This was a first briefing item. The board will vote on the bids after a second briefing at the next regular meeting. The trustees were briefed on bid recommendations for contractors to perform the 2013 summer paving projects. The first briefing was presented by Randy Trent, AAPS executive director of physical properties. Trent had interviewed the lowest qualified bidders: Best Asphalt from Romulus, Barrett Paving of Ypsilanti, and Quality Asphalt of Howell. After the time when district conducted due diligence, Barrett Paving withdrew its bid. Contract awards are recommended for Best Asphalt at $377,535 and Quality Asphalt at $60,208 to perform the paving projects. Trent noted that Best Asphalt previously has done paving projects for the district, and Quality Asphalt has tried to get projects with the district in the past. The projects are funded through the district’s 2010 sinking fund. The schools where parking lot or sport court paving is being done in summer 2013 are: Allen Elementary, Ann Arbor Preschool and Family Center, Ann Arbor Tech High, Bryant Elementary, Roberto Clemente Student Development Center, Dicken Elementary, Forsythe Middle, Haisley Elementary, Huron High, Northside Elementary, Scarlett Middle, Slauson Middle, Tappan Middle, and Wines Elementary. Trent briefed the board on a recommendation to renew the district’s lease of Freeman School to Go Like the Wind Montessori School. The district has leased the building to Go Like the Wind since 1987. The building is located at 3540 Dixboro Lane in Superior Township. Trent mentioned that the tenants have paid for renovations over the past 10 years, while the district pays for maintenance. After Thomas asked about the possibility of selling the school, Trent said that as a school building, the property was not very lucrative. When it was last assessed several years ago, it was appraised at $600,000 for the building and the 40 acres of land it sits on. However, if the area becomes more developed in the future, Trent said, it could be an important property for the district to own. Outcome: This was a first briefing item. The board will vote on lease renewal after a second briefing at the next regular meeting. As part of the consent agenda, the trustees unanimously approved the 2013 spring grant awards. There was no discussion about the grants at the meeting. The entire cost of SchoolMessenger will be covered by the two grants from the Ann Arbor PTO Thrift Shop and AAPSEF. The board had been initially briefed on the grants at its April 10, 2013 meeting. Outcome: The board unanimously approved the receipt and expenditures of the 2013 spring grant awards. The trustees recently voted to move back to a standing committee structure. There are now four committees: planning, performance, governance, and executive. Planning and performance committees will look deeply into topics, then bring forward to the board an executive summary and recommendations. Governance will look at areas of board policy and boardsmanship. The executive committee, made up of the committee chairs and the president, will set the agenda. After polling the trustees as to where they would like to serve, Mexicotte named the committees. As all the trustees were amenable to the committee appointments, Mexicotte noted that the executive committee will meet as soon as possible to set the upcoming agenda. She also requested that the committee chairs poll their members to set up a meeting schedule. Other ad-hoc committees that have been formed, such committee formed to look at the district’s contract policy, will continue their work outside the standing committee structure. As the board moves to a standing committee structure, the agenda will need to be rearranged. Many of the items that were scheduled to be presented and discussed at regular meetings or at committee of the whole meetings will be divided up between planning and performance. Mexicotte proposed splitting up six of the topics: special education metrics, Roberto Clemente follow-up discussion, curriculum report, climate survey report, communications update, and preschool and HeadStart report. She recognized that the topics may not necessarily fit into the mission of the committees, but are put there because of the workload. Five associations are invited to make regular reports to the school board: the Black Parents Student Support Group (BPSSG), the Ann Arbor Parent Advisory Committee for Special Education (AAPAC), the Parent Teacher Organization Council (PTOC), the Ann Arbor Administrators Association (AAAA), and the Ann Arbor Education Association (AAEA.) The Youth Senate is also invited to speak once a month, alternating with representative groups from each of the high schools. At the April 24, 2013 meeting, the board heard from AAPAC, PTOC, AAAA, and AAEA. AAPAC representative Erica Melnykowycz asked that the trustees recognize that students identified as having a disability are legally entitled to receive special education services that are individualized. She emphasized the importance of making sure students’ right to a Free Appropriate Public Education is considered when making budget decisions. AAPAC also asked for the continued support of SISS and the general education administration of the Disability Awareness Workshops, workshops for 4th graders to experience the challenges of living with a disability. Amy Pachera, PTOC representative, thanked Flye and her team for their presentation to the PTOC on the balanced assessment system. During the presentation, they explained the testing students go through and the reasons for them. Pachera also addressed the public who spoke during public commentary about budget cuts. “When you have to cut a budget $15 million four years straight,” parents must get involved, she said. If the way schools are funded in Michigan doesn’t change, they will have to cut what makes AAPS so excellent. Kathy Scarnecchia, Haisley principal, represented AAAA. She congratulated Green on her retirement, and asked that the board consider allowing AAAA to be part of the process for selecting the interim and permanent superintendent. She also said that AAAA “remains open to dialoging with you” regarding tough budget cuts. Linda Carter, AAEA president, said in no uncertain terms: “The AAEA bank is officially closed.” The members of AAEA have sacrificed to keep the quality of education at the highest level, she said, but they cannot continue to see smaller paychecks. 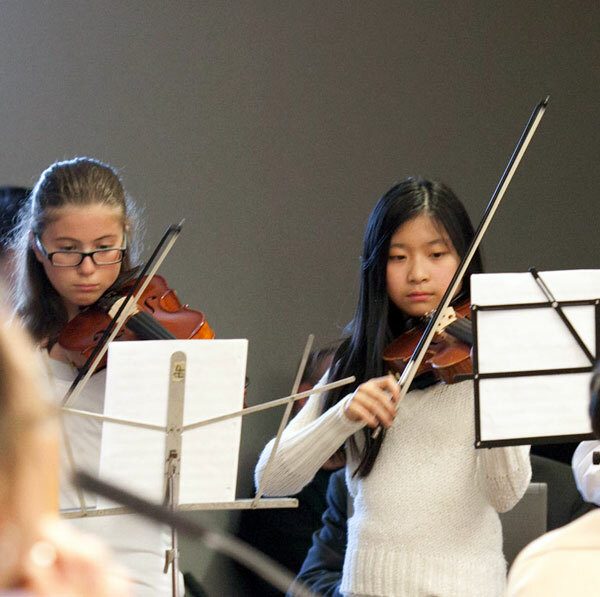 The board meeting was started off with a performance by Tappan Middle School 6th grade orchestra, under the direction of Joe DeMarsh. The group performed two pieces for the trustees. Before the performance, DeMarsh congratulated his colleagues for their work in making AAPS one of the best communities for music education, as listed by the NAMM Foundation. The trustees formally recognized the district’s administrative professionals by approving a proclamation in acknowledgement of administrative professionals week. Executive assistant to the board of education Amy Osinski. The board recognized administrative professionals week. Mexicotte thanked the administrative professionals for their day-to-day work, as well as for their “sacrifice to the district.” As part of the AAEA office administrators bargaining unit, administrative professional now have mandated furlough days in 2013-14 and 2014-15. 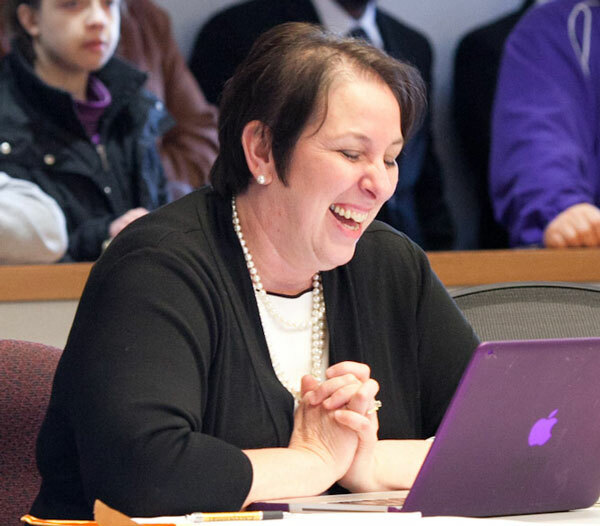 Mexicotte also singled out “the tireless work” of Amy Osinski, executive assistant to the board of education. In her superintendent report, Green highlighted several achievements: student accomplishments in art and music; a Gates Millennium Scholar finalist; success in the TeamWorks competition; Carpenter Elementary’s 175 anniversary; the Washtenaw Elementary Science Olympiad (WESO); and accomplishments of several teachers. Green also acknowledged the “tremendous job” done by AAPS administrative professionals. During public commentary, Stephen Barrett of St. Mary’s Lodge #4 spoke to recognize the efforts of Clemente and Community High students who assisted with the Lodge’s Adopt-A-Highway clean-up. Stephen Barrett of St. Mary’s Lodge #4. When students do something positive, they need to be recognized, he said. During “items from the board,” Nelson reported that he had attended both the Choral Cavalcade and an event at the Neutral Zone. He said he was always impressed by the leadership of the Neutral Zone. Stead also recognized WESO, saying it was a “high energy event” that she was very proud of. Stead, Lightfoot, and Baskett all thanked Patricia Jenkins, the Skyline Communication, Public Policy, and Media Magnet lead teacher for work she and some of her students had done. As the board considered the May 8 agenda, priority was given to “a continued discussion of the budget.” A budget discussion update was added. A University of Michigan student presentation – about the ways student voices can enhance and improve the district – was referred to a committee. While Mexicotte noted the students had been working hard to meet her requests of relevancy and efficiency in presentation, the trustees decided their focus should be on the budget. They also voted to schedule an executive session on May 8 before the regular meeting for the purpose of labor negotiations. Outcome: The agenda, with the above changes, was unanimously approved. Several trustees reported on various meetings and conferences they had recently attended. Stead, Lightfoot, and Baskett attended the Pioneer PTSO, which Stead said ended up being like a pseudo-community budget dialogue. At that meeting, Baskett said, she connected with a parent who was interested in helping write grants for the district. Patalan noted her own and Stead’s attendance at the Governor’s Education Summit. She said that she was proud that AAPS has already had conversations about a strategic plan, part of which other districts are only now just beginning to do. 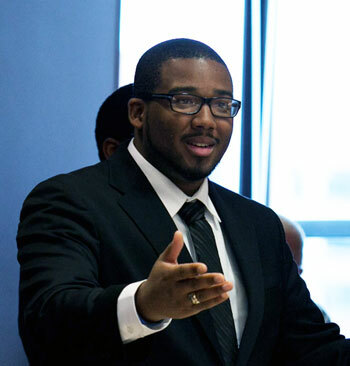 Thomas noted he and Stead were part of a panel at University of Detroit Mercy Law School, which focused on the interaction between all levels of government. Present: President Deb Mexicotte, vice president Christine Stead, treasurer Glenn Nelson, secretary Andy Thomas, and trustees Susan Baskett, Simone Lightfoot, and Irene Patalan. Next regular meeting: May 8, 2013, 7 p.m., at the downtown Ann Arbor District Library’s fourth floor meeting room, 343 S. Fifth Ave. The Chronicle relies in part on regular voluntary subscriptions to support our coverage of public bodies like the Ann Arbor Public Schools board of education. Check out this link for details: Subscribe to The Chronicle. And if you’re already supporting us, please encourage your friends, neighbors and colleagues to help support The Chronicle, too! I am grateful that the trustees have decided not to advertise the superintendent position with the Broad Center, which has been behind many initiatives that I believe have been harmful to the state’s (and nation’s) schools.